Jamila Elaiwa, who founded the center 20 years ago, told the New York Times the remaining 14 residents of the Mabaret Palestine Society home were visiting their families. Ms. Elaiwa spoke to the Times at Gaza’s Shifa’s hospital’s burn unit. She was there visiting the wounded survivors of the building’s destruction, two of whom were Mai Hamada, 30, and Salwa Abu al-Qomssan, 53, the caretaker, both of them with severe burns. Jamila Elaiwa, the founder of the Mabaret Palestine Society, suggested the attack must have been pre-planned, and was not one of Israel’s unfortunate “accidents”, as Israel claimed was the case with the bomb that killed nine Palestinians sitting on the beach watching a TV presentation of a World Cup football match. She recalled a small explosion on the building roof a few minutes before the bomb hit that destroyed the home for the handicapped. That smaller explosion would have been an Israeli “roof knocking” message, which Israel claims is meant to warn occupants to leave the building. These were occupants, however, who were not physically capable of making a fast exit. In its story reporting the bombing of the home, the Times reports that Israel bombed a mosque which Israel claimed “aerial photos indicated was harboring a weapons cache”. The mosque was destroyed. No casualties were reported. What the Times did not report was that the “weapons cache” claim is a frequent Israeli excuse for bombing sacred buildings. This is clearly an asymmetrical (as in excessively one-sided) war. It is also an ongoing war that is renewed almost every two years or so. Prime Minister Benjamin Netanyahu said he is not interested in a cease fire. Of course he is not. He will stop this recurring devastation when he feels he has weakened Hamas for this round. The bell will ring when he gives the signal for it to ring. That is his pattern. After Hamas’ 2006 victory over Israel’s preferred US military-trained Fatah army, Israel has found some convenient pretext to repeatedly launch vicious and highly destructive air, and sometimes ground, assaults against Hamas. The assaults are like clockwork, starting in 2007. That assault was followed by the 2008-09 assault, then, after pausing during Obama’s first year in office, it was back to the attack in 2012. Now, right on schedule, in 2014, we are in the midst of “Operation Protective Edge”. Israel gives its Gaza recurring attacks, nice media-friendly, noble-sounding names. In 2012, the attack bore the memorable monikers, “Pillar of Defense” or literally: “Pillar of Cloud”. In 2008-09, the name was “Operation Cast Lead”. Like the Bob Gibson folk song, “The Thinking Man”, Israel is reported to have a department with the sole responsibility of “thinking up names” for its lethal incursions into Gaza and Lebanon. Each round of violence on Palestinians is marketed with the same non accountable predictability, an Israeli-designed narrative that American mainstream media and American politicians, accept and then sell to the American public, performing their duties as Israel’s peddlers. During the 2012 attack, in a Wall Writings posting, I described Israel’s handling of Gaza to be “the managing of a crisis”. The management involved the rationing of foodstuffs, medicine, and other vital human needs. Israel has maintained its detailed management of “the crisis” since that 2012 war. There are occasional signs that Netanyahu may be losing control of some in the main stream media. Brian Williams, of NBC news, did a piece this week on his nightly report which he headed, “Gaza trapped in lop sided conflict”. One major U.S. media star, ABC news anchor Dianne Sawyer, was doing her best “two sides” are suffering story in this asymmetrical conflict, when she put up two pictures of destruction which she said were from Israel. Sawyer later apologized, but apologies for obvious errors never quite catch up to the first impression of “destruction on both sides” that ABC gave its viewers. Some staffer in the production chain should have raised a red flag, shouting error, error. Did these people not watch Aaron Sorkin’s brilliant cable television series Network? That fictional crew made its mistakes, but they would know which side has the more destructive arms. Outside the U.S., crucial international support for Israel’s blank check to attack at will, may also be lessening. The United Nations Security Council, and just about every other international organization witnessing this one-way carnage, has called for a cease fire, an indication that Israel may have to end this round sooner than Netanyahu had planned. Away from the main stream media, the alternative media is hitting hard at Netanyahu. The message there is seen by opinion makers, but they are slow to present it to the public. A Real News Network interview of Jewish American journalist Max Blumenthal and Palestinian American journalist Ali Abunimah refutes Israel’s narrative with a discussion of “Israeli Propaganda and the Politics of Revenge against Gaza”. Netanyahu knows that as long as he wants to drag out this 2014 assault, the U.S. Congress has his back. The most recent example: Two U.S. Senate leaders, Republican Lindsay Graham, of South Carolina, and New York Democrat Chuck Schumer, the bipartisan pro-Israel twins of the upper chamber, demonstrated their undying loyalty to a sovereign foreign nation. Together with fellow bipartisan pro-Israel senators Robert Menendez, Democrat, New Jersey, and Kelly Ayotte, Republican, New Hampshire, they introduced a “resolution expressing support for the State of Israel as it defends itself against unprovoked attacks from the Hamas terrorist organization”. The resolution endorses Israel’s current assault, calls for Fatah to withdraw from its unity talks with Hamas, and most importantly insists “Israel has the right to defend itself”. Each succeeding Israeli government prepares for its recurring Gaza attack by following the same script that always ends with the victim-oriented mantra that “Israel has the right to defend itself”. During its two-year long pause between attacks, Israel plays the “peace process” game. However, after the dismal failure of this year’s proceedings, Israel and the U.S. will have to come up with a new reason to hit the pause button between Israel’s wars. After the pause, Israel always begins its recurring (2007, 2009, 2012, and 2014) Gaza attacks by building up Israel’s ever-present “existential anxiety”— fear and anger–that seethes within its easily manipulated population. Next, Israel grabs whatever provocative event that emerges. The event is then manufactured to serve Israel’s plan to play the victim card. In their need to defend the homeland, Israel starts another war. For the 2014 attack on Gaza, an especially lurid provocation arrived with the deaths of three Israeli teen agers in IDF controlled territory in Hebron. Israel knew from the outset that from the recording of gunshots behind a desperate cell phone call for help, the search for the three Israelis would be a search for three dead Israelis. Nevertheless, Israeli Prime Minister Benjamin Netanyahu exploited the story of the missing teenagers to charge up the emotions of his population. He even sent the mother of one of the teen agers to Geneva to appeal to the United Nations Human Rights Council for help. When the three bodies were finally found, buried by the side of the road under a few rocks, Netanyahu repeated his initial accusation that Hamas was behind the disappearance of the Israelis. He also had the names of two Hamas operatives who lived in the area. They were deemed, by fiat, as guilty of kidnapping the teen agers. 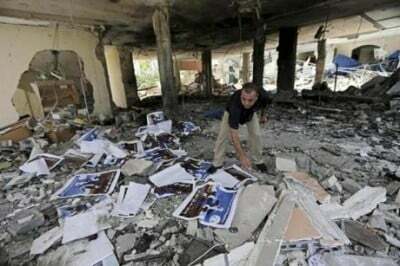 Netanyahu ordered the homes of both men destroyed. No evidence or charges have surfaced. It was time to start the 2014 War on Hamas. Cue the massing of troops on the border, artillery at the ready, and send the bombers aloft. Operation Knife’s Edge was ready to roll. If this were a work of fiction, about this time in the story the reader would be demanding to know where the two so-called Hamas “killers” are hiding in an area swarming with Israeli police and soldiers. The reader just may think, maybe, just maybe, Israel has found the two Hamas agents. If so, still with no evidence against them, they may be now be dead, their bodies hidden until a more propitious time when they will appear in the Israeli narrative, more likely dead than alive. Who can say, but in the narrative according to Netanyahu, the two “missing” Hamas men have served their purpose. They were only the latest pair of provocateurs utilized by Israel to kick off its next act of war. A number of Israeli journalists, many from Ha’aretz, know that Netayahu’s narrative is damaging Israel to within an inch of its future as a nation. Unfortunately for the citizens of Gaza, this current round of the recurring War Against Gaza means many Gazans, as of this weekend more than 160, will die. Richard Silverstein is reporting that “an invasion is imminent”, which means that an invasion could come at some time Sunday morning, Gaza time. 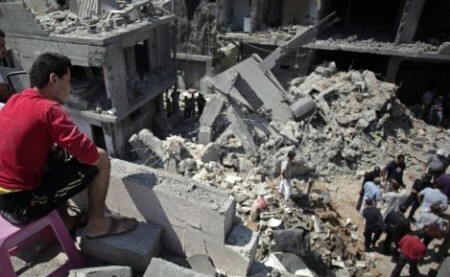 The invasion threat is day to day, guaranteeing more Gaza deaths. Hamas militants insist on firing rockets at Israel. It is a self-defeating action, one that hands Netanyahu his rational for going to war. The rockets are largely ineffective. Yet the US mainstream media including the more “progressive” NPR and MSNBC, repeatedly report the rocket attacks as equally frightening as Israeli bombs and artillery shelling. Pay close attention, you can usually hear at the end of a “progressive” broadcast report, come the good news, “some rockets got through the protective dome, but there were no injuries”. The ineffective rockets from Hamas serve no one but Israel. Not a single Israeli death had been reported by this Saturday night. What matters for Israel is that the rockets fired by militants in Gaza keep reaching targets deeper and deeper in Israel, sending Israelis fleeing for bomb shelters. What better way to keep the Israeli public in perpetual fear and hatred. CNN, which is trying to outdo Fox News in selling the Israeli narrative, has sent its ace journalist, former AIPAC staffer Wolf Blitzer, into Israel to report on those rocket attacks. The problem for the stronger side in an asymmetrical war is that a case must be made that the stronger side is always in great danger. Max Blumberg, an America Jewish journalist, has reported on Twitter that CNN’s favorite and oft-repeated visual from Israel’s home front is a scene of Blitzer in Israel when an Hamas rocket is reported to be on its way. Blitzer races to the nearest bomb shelter, a CNN cameraman close behind showing the “danger” Israeli citizens face. No CNN visuals yet of the bombs falling in Gaza. Meanwhile, the asymmetrical bombing of Gaza, with the ultimate destruction of Hamas, and Israel’s complete control of all Palestinian land, as its goal, is about to enter its second week. What about President Barack Obama in all this? Obama has talked with Netanyahu. What does our President say after those “chats”. He says what all American politicians say, “Israel has a right to defend itself”. That is the height of absurdity. 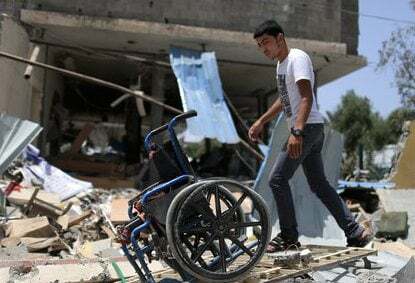 In response to ineffective rockets, bombing a home for the handicapped, destroying mosques, eliminating an already battered Gaza water works, highways, cities, killing more than 160 Palestinians, a large number of whom are women and children, while keeping 1.7 million Palestinians locked up in a Gaza prison, is most certainly not “Israel defending itself”. It is, rather, Israel destroying itself, and like Samson of old, Israel is pulling down the temple on the entire region, starting with Palestine.